Restoring a classic muscle car can be a fun project, but in order to help the vehicle retain or increase in value while remaining fun, the restoration and any modifications, must be done correctly. As you probably know, automotive technology has improved considerably in the last several decades, and in order to get the maximum enjoyment out of your vehicle, you most likely will need to "restify" it, a resto/modify combo. 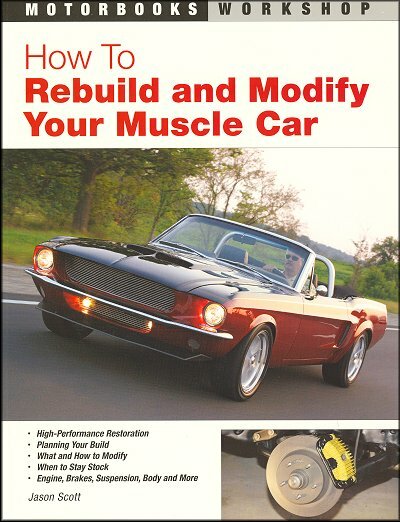 In How To Rebuild and Modify Your Muscle Car, Jason Scott shows you how it's done. He explains the whole process with words and lots of step-by-step photos. You will learn how to switch from old drum brakes to newer and safer disc brakes; ditch the old carb in favor of a more reliable fuel injection system, improve the suspension, and much more. The result will be a car that looks as good (or better) than the day that it rolled off the assembly line, with all the benefits of modern technology. Ask a question about How To Rebuild and Modify Your Muscle Car.